The Live Reports are designed to help you gain and share easy access to your SEO projects, with multiple data sources, clear graphs, lists and KPIs. When you start a new AWR account, there are 5 predefined live reports, or dashboards, that come in handy. 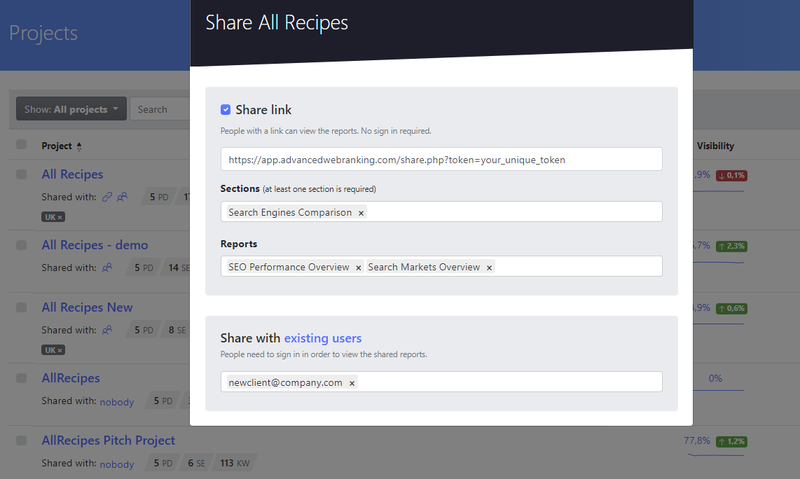 They live under Reports, with the possibility to pin your favorite one and see the most relevant insights by default each time you access this menu for a specific SEO project. This live report is recommended for seo managers, showing a brief overview of the top SEO objectives in terms of Rankings, Analytics and Search Console stats. With this dashboard, the focus is on ranking position changes. It is recommended for keyword data analysts, helping them to easily get an overview of the visibility trend, as well as identify best and worst performing keywords. This dashboard is recommended for campaigns that monitor rankings on multiple search engines, giving you the possibility to compare results side by side. This live report offers you powerful insights about the competition. In addition to their ranking and visibility trends, you can also get a peak at the estimated traffic and CTR that your competitors receive for your top targeted keywords. 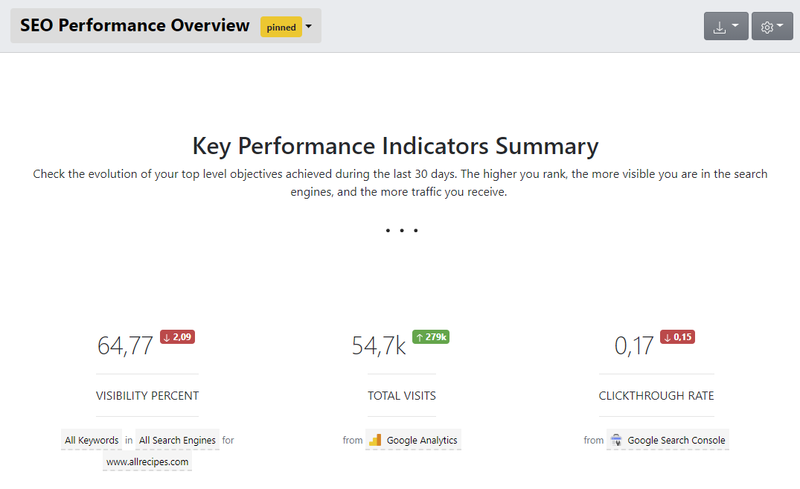 With this dashboard, you can quickly visualize the evolution in time of your search visibility, and see how the ranking net gain influences your CTR and visits estimates. The live reports in AWR are global across all projects that you are managing on the account. 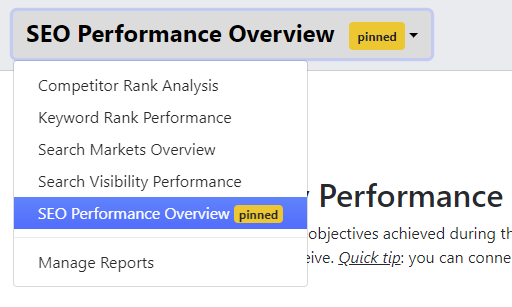 When you navigate to a new project, the pinned report will load first, showing you the data related to the website and keywords tracked in that new project. To navigate between live reports within the same project, simply click next to the "pinned" label to open the dropdown and choose the one you would like to see. The predefined live reports, as well as new ones that you create from scratch, can be customized according to your own reporting needs. 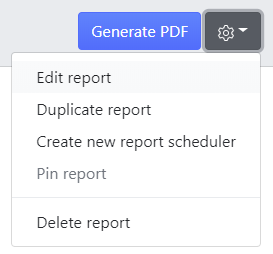 To customize a report, just click on the small settings icon and choose Edit report. While in edit mode, you can change the name and descriptions of the report, add or remove data widgets, or change the report design with the help of headings, dividers, text and images. Widgets can also be customized to show the data for specific keywords, groups, websites or search engines, or to show the data with a particular filtering preference. Before saving the changes, you have the possibility to quickly Preview the report and check the live data that it will provide. Changes made on the report are global, being visible across all projects in your account, except for those that involve specific project inputs, filters or sorting preferences. 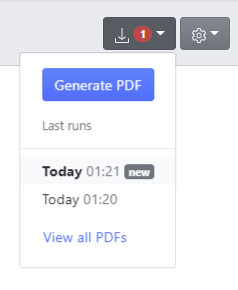 For live reports where no files were created yet, simply click on the Generate PDF button. As soon as the report file is created, you will see a notification and the direct link to get the report file.